It takes a bit of will power to give up on a tactic which has been producing lots of action and try something different. Anyway, one morning this week I actually managed to summon up enough guts to give it a go. For three mornings on the trot I'd been hammering out good bass, pollack and mackerel on the fly and I have to say the sport was wonderful. When my pal Rob emailed and asked whether I could cope with a fourth early morning I said I wasn't sure. I set the alarm and when it went off at 04:15 I almost turned over and went back to sleep but deep in my subconscious was a picture of Rob hauling out fish, so up I got. Then came the bold bit. I left the fly rod at home and only took a spinning rod armed with a small silver Toby (I'd replaced the treble with a single hook so as not to damage the anticipated mackerel). I also took my 12ft pike rod and a reel loaded with 30lb Whiplash, a size 6/0 Varivas circle hook snelled onto three feet of 20lb Memorex nylon. This was for the livebait - if I caught one. I met Rob in the car park on the dot of 05:00 and we made our way to the shore. On the strength of our recent results Rob was armed with his fly gear. The sea was even calmer than it had been the previous three days so I was optimistic - at least about the fly fishing. I would have been quite happy watching my pal catch fish. As expected we were a little early for the fish and it was not until about 05:30 that we began to get bites. I missed the first two or three taps on the Toby but eventually I was in and landed a nice fat mackerel. 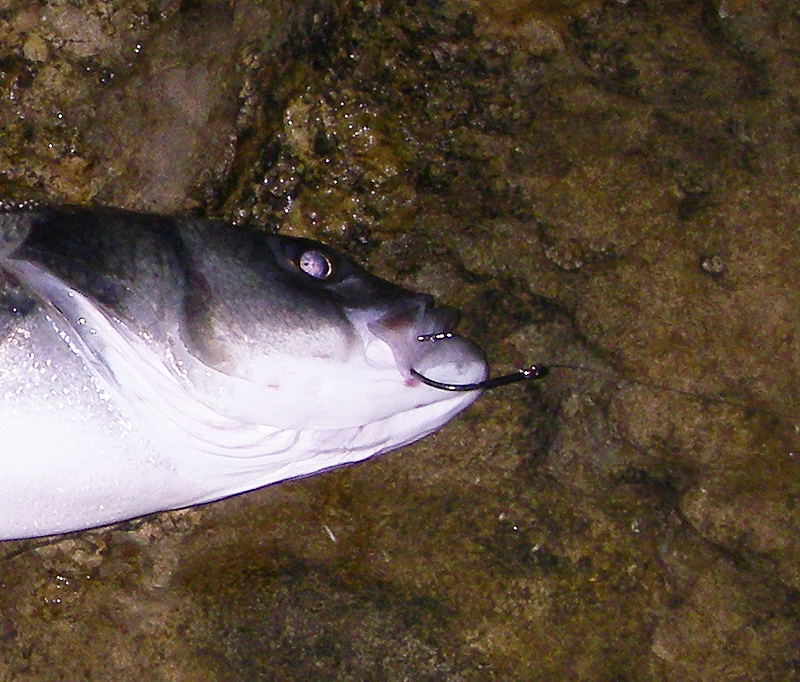 I laid down the spinning rod, put the circle hook through the upper lip of the mackerel and lowered it into the sea. Away it swam out to sea with me paying out line through my fingers. 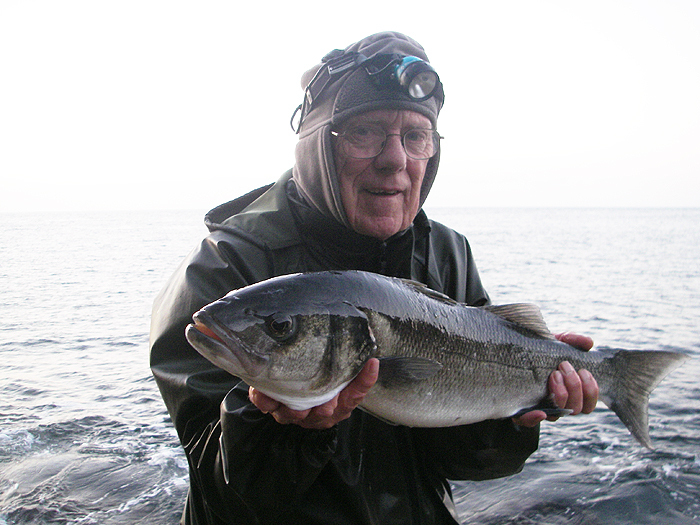 For some time I stood as my bait paraded itself around the ocean in search of bass. Rob had a mackerel on the fly and then a couple of nice pollack but, to be honest, the fly fishing was quiet, so I did not feel too bad about my biteless wait. It was perhaps ten-past-six and quite bright when the throbbing of the mackerel on my line changed to a stronger, steadier pull. I called to Rob that I had a take and felt the line streaming out faster and faster. Knock over the bale arm and wait for the line to tighten, the rod began to bend'It's on!' I called. Then after a couple of seconds the tension reduced and my fish was gone. I muttered a few curses and wound in the mackerel, now stiff and dead, and lifted it up for inspection. 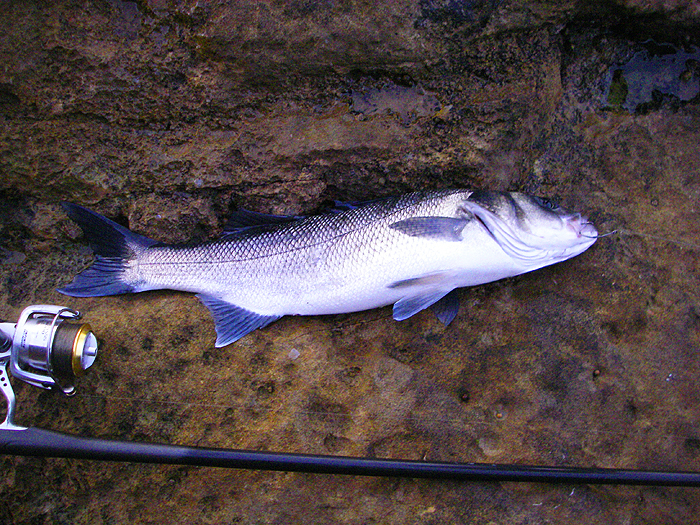 The circle hook had slipped round and the point was digging into the skin of the bait's head. What a downer. Once more I picked up the spinning rod and winged the Toby out to sea. Almost before I could wind I was into another mackerel. Excellent! For a second time I carefully unhooked the mackerel and impaled its upper lip on the circle hook. Away it went, just as lively as the first one. This time it was not more than ten minutes before the bait was taken. I let the fish go for a little while and then tightened. The fish was on. The rod bowed and the clutch buzzed as line was dragged from the reel. Clearly it was a decent bass. Five minutes later I was able to slide the fish ashore on a suitable wave and Rob jumped down to pick it up for me. One or two pictures and back it went, fit and well. We didn't weigh it but it was certainly over six pounds. By now my watch said that it was after 06:30 and time for us to pack in. We trudged back to the cars well pleased with the morning. I wonder why the fly wasn't more productive? That's fishing!